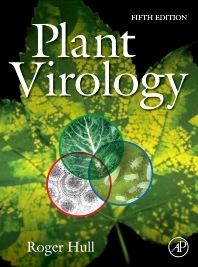 The seminal text Plant Virology is now in its fifth edition. It has been 10 years since the publication of the fourth edition, during which there has been an explosion of conceptual and factual advances. The fifth edition of Plant Virology updates and revises many details of the previous edition while retaining the important earlier results that constitute the field's conceptual foundation. Revamped art, along with fully updated references and increased focus on molecular biology, transgenic resistance, aphid transmission, and new, cutting-edge topics, bring the volume up to date and maintain its value as an essential reference for researchers and students in the field. Researchers and students in plant virology and pathology, as well as other branches of virology (animal, bacterial, etc.). Roger Hull graduated in Botany from Cambridge University in 1960, and subsequently studied plant virus epidemiology at London University’s Wye College, gaining a PhD in 1964. He lectured on agricultural botany there between 1960 and 1965. He was seconded to Makerere University in Kampala, Uganda in 1964 where he taught, and learnt tropical agricultural botany and studied the epidemiology of groundnut rosette disease. By watching aphids land on groundnut plants he gained an understanding of the edge effect of spread of virus into the field. In 1965 Roger Hull joined Roy Markham at the ARC Virus Research Unit in Cambridge, UK where he worked on biophysical and biochemical characterization of a range of viruses, especially Alfalfa mosaic virus. This work continued when he moved to the John Innes Institute, Norwich with Roy Markham in 1968. There Dr Hull became a project leader and deputy head of the Virus Research Department. In 1974 he spent a sabbatical year with Bob Shepherd in the University of California, Davis where he worked on the characterization of cauliflower mosaic virus. There he was introduced to the early stages of molecular biology which changed the direction of his research. On returning to the John Innes Institute he applied a molecular biological approach to the study of cauliflower mosaic virus elucidating that it replicated by reverse transcription, the first plant virus being shown to do so. Involvement with the Rockefeller Rice Biotechnology Program reawakened his interest in tropical agricultural problems and he led a large group studying the viruses of the rice tungro disease complex. He also promoted the use of transgenic technology to the control of virus diseases and was in the forefront in discussing biosafety issues associated with this approach. Moving from rice to bananas (plantains) his group was among those who discovered that the genome of banana streak badnavirus was integrated into the host genome and in certain cultivars was activated to give episomal infection – another first for plant viruses. He retired at the statutory age in 1997.